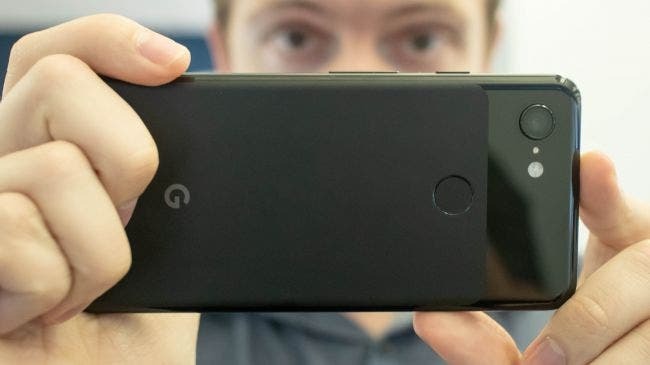 The Google Pixel 3 is promising to give you the best smartphone camera in 2018 – or at least that's the bold title Google intends to claim thanks to its machine-learning camera smarts. Is it that much better than the Google Pixel 2? We're currently exploring this phone in a hands-on and laying out the specs below. Here's what we think so far. Pre-orders begin around the world today. The US Google Pixel 3 price starts at $799 for the 64GB version, while the 128GB edition is $100 more at $899. Google's larger Pixel 3 XL is also a $100 premium, in case you're considering the larger screen size. In the UK the price is £739 (64GB) and £839 (128GB), while in Australia you're going to be paying AU$1,199 for 64GB and AU$1,349 for 128GB. We'll have more Pixel 3 prices as the shipping date nears. You're paying for the more expansive screen and machine-learning camera here, and the fact that flagship smartphones cost more in general. It's certainly a jump in price. In the US, for example, last year's smaller Pixel started at $649. And now it's $799, so you'll be shelling out $150 more. 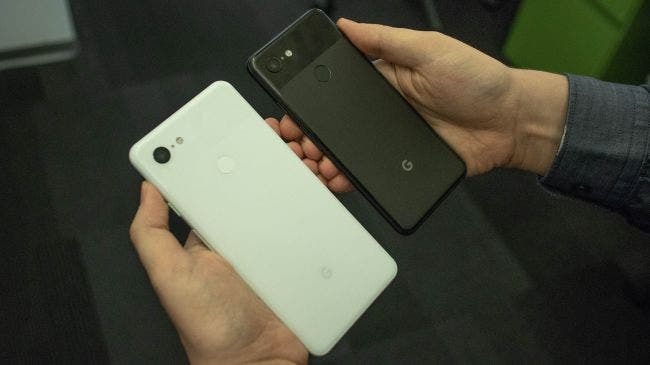 The Pixel 3 retains Google's familiar two-tone design – the back has shiny glass at the top, while lower 80% has a matte finish. There's a more seamless transition between the two textures, but it look hasn't changed dramatically. But the Pixel 3 series uses different materials this year. The entire back is made of soft-touch glass using Corning Gorilla Glass 5. It's the same strengthened glass that protecting the front screen, and it's all sandwiching an aluminum frame with that has a hybrid coating – that's the only bit of metal you'll find on the outside. Sure, the all-glass design makes the Pixel 3 more susceptible to damage, but it also enables a better LTE connection and wireless charging. 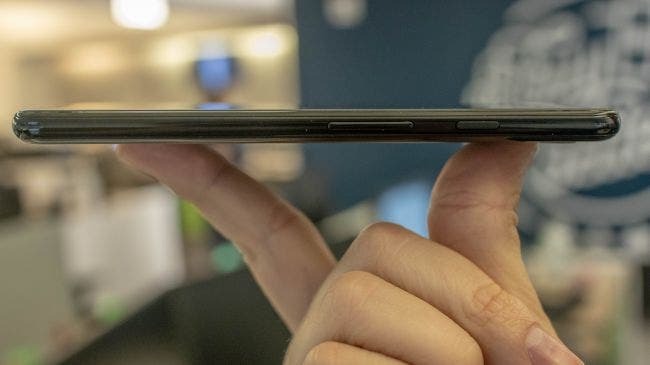 That's why we've seen a lack of aluminum-backed flagship phones in 2018. The Pixel 3 is the latest causality. 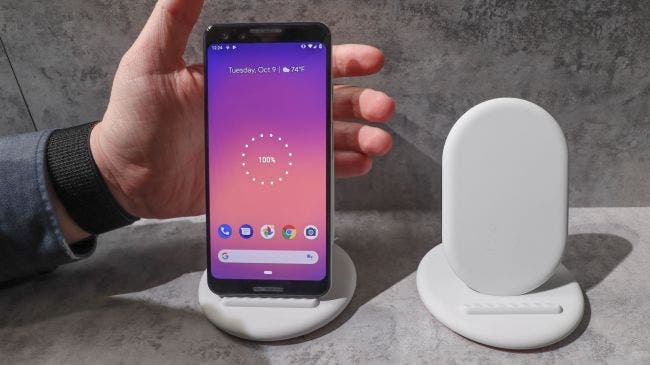 Wireless charging is a new feature for the Pixel phones, and a welcome change now that Google is launching the Pixel Stand wireless charger alongside its new devices. We haven't had a wirelessly charging Google phone since the plastic Nexus 6. We're also seeing the phone has more rounded edges everywhere on the Pixel 3. Its frame is less boxy than previous Google phones, a trend we've seen from the iPhone and and others. Gone is the harsher silver bevel around the frame and rear fingerprint sensor. It's like Google put the Pixel 2 through a smoothing machine. You'll still find dual front-facing speakers on the Google Pixel 3. No one else is really doing this anymore, so it's nice. You'll also get Active Edge, which allows you to squeeze the sides of the phone to call up Google Assistant. We much prefer this as opposed to a dedicated AI button, like Samsung does with Bixby button (which we also confuse for the volume down button). No, there's no headphone jack on this smartphone (just like last year) and you won't find a microSD card slot anywhere (we looked). The 64GB and 128GB storage configurations are what you're stuck with. 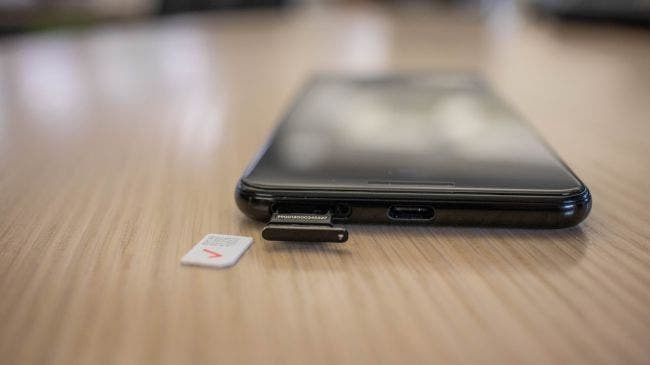 There is a SIM card tray slot, interestingly at the bottom of the device right next to the USB-C port. The Pixel 3 color Just Black is our favorite of the trio. Clearly White looks cheaper and Not Pink isn't for everyone. It's the color you want if you're looking to stand out, but we preferred last year's unique Mint color. You will get a fresh Mint color on the white Google Pixel 3, however. 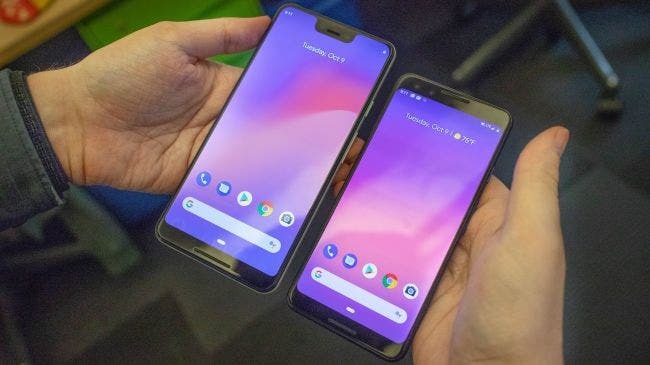 The Pixel 3 screen, at first blush, looks richer than last year's Pixel 2. The specs note that it has only a few more pixels per inch, but keep in mind the screen much taller. There's noticeably less bezel thanks to 18:9 aspect ratio rather than the dated 16:9 look. Last year's oversized bezel, we felt, was the big disappointment design-wise about the smaller 2017 Pixel phone. The Pixel 3 has a 2,915mAh battery, which is slightly smaller than we had hoped (the Samsung Galaxy S9 has a 3,000mAh and we think that could stand to last longer), but it's still an improvement over last year's 5-inch Pixel, which a 2,700mAh unit. Google's Android 9 Pie software should give it more juice too. You'll still be able to get all-day battery life from this device with normal use, and you will certainly benefit from fast 18W and new wireless charging. The Google Pixel 3 is powered by a Qualcomm Snapdragon 845 and 4GB of RAM. It's unlikely to be the fastest performer when other phone makers are touting 6GB of RAM and Apple's A12 chipset beats the Snapdragon 845 handedly. However, Google owning the hardware and software should prove beneficial for smooth performance. The Pixel Visual Core is a separate, dedicated chip that helps give the camera that wow factor. Combined with the 12.2MP camera, we'll see machine-learning features that pick the best photo to avoid blurriness and closed eyes called Top Shot. The rear-facing camera's f/1.8 aperture isn't record-breaking among fast apertures, but modes like Night Sight are supposed to give the Google Pixel 3 the edge when taking nighttime photos. At the launch event, Google demonstrated how it can even beat the iPhone XS at low-light photos. It'll shoot with larger 1.4 micron pixels and has optical and electronic image stabilization. Video records in 4K at a max of 30fps. When it comes to selfie photos, we really liked the idea of Group Selfie Camera, the second camera on the front. The two 8MP cameras provide a normal 75 degree field of view or a 97 degree field of view. The apertures do differ here: f/2.2 for the wide-angle lens and f/1.8 for the normal selfie lens. The Google Pixel 3 is offering a lot, and in a tighter package than the Google Pixel 3 XL. 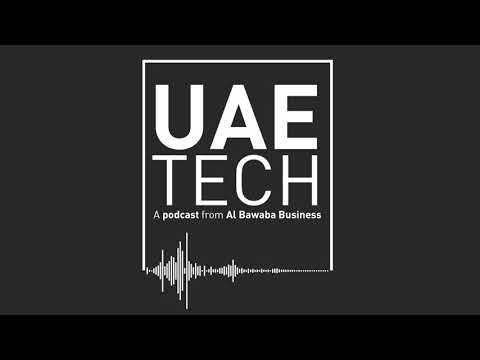 It has dual front-firing speakers, a promising 12.2MP camera backed by machine learning, and a much better display than the one we got last year. This is the one-hand-friendly version of the Pixel 3 XL that your grip might appreciate. 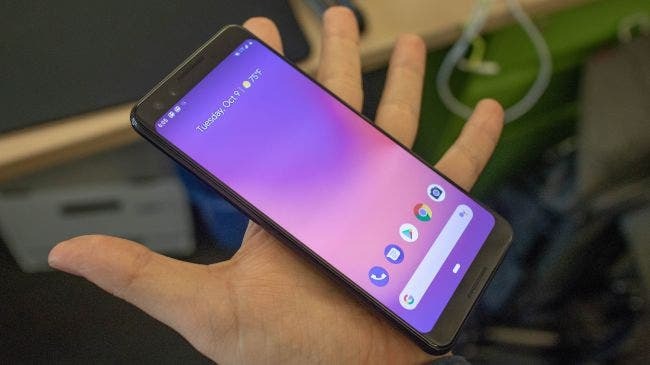 It costs less than an iPhone XS, and it runs pure Android Pie, with promise of the latest operating system updates straight from Google. It looks like a good value for what you're getting, even if it's a price increase over last year's phone. But we'll have to check out the battery life and camera more closely in the coming days.